From time to time, I tend to forget the amount of work, all the invested hours and all the effort required for finishing any piece of code. Even a small game or application, if doing it right, will take a lot of hours, days and even weeks. I forgot how hard was developing, till the last shape, CRM32Pro and creating a new beast with all the CRM32Pro features plus much more, all of them from the scratch, have taken me about 3 years. It is true that during several months, due to my current job and/or personal things, I could not do anything but wait for better days. 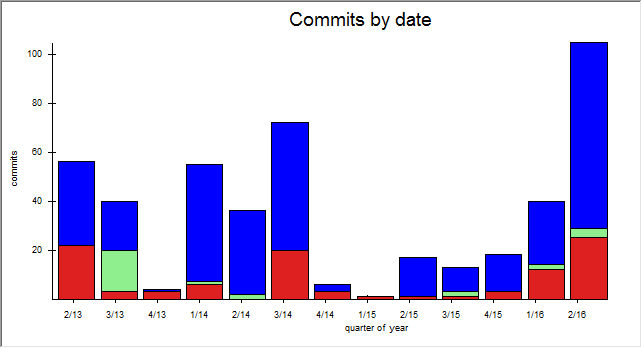 If you are interested, I have attached a screenshot of the number of commits performed from the beginning to now where you can see the development time line. Finally and after investing soo much time on it, I am quite confident the result is a great cross-platform library for developing 2D games, greater than CRM32Pro although the timing is not the same. When CRM32Pro was launched, there was a lot of interest on developing 2D games, nowadays, the world is fully commited to 3D games but I think there is still place for good 2D titles so I hope all my efforts can help, at least, to the same number of people that the CRM32Pro did. Of course, do you know? there are some pending tasks (check current status here), but the major components are finished. As some of you are asking me for a pre-release, I will do it during next days while I keep working on the Tile Engine.